The January Mullen briefing was unprecedented. No previous CENTCOM commander had ever expressed himself on what is essentially a political issue; which is why the briefers were careful to tell Mullen that their conclusions followed from a December 2009 tour of the region where, on Petraeus’s instructions, they spoke to senior Arab leaders. “Everywhere they went, the message was pretty humbling,” a Pentagon officer familiar with the briefing says. “America was not only viewed as weak, but its military posture in the region was eroding.” But Petraeus wasn’t finished: two days after the Mullen briefing, Petraeus sent a paper to the White House requesting that the West Bank and Gaza (which, with Israel, is a part of the European Command – or EUCOM), be made a part of his area of operations. Petraeus’s reason was straightforward: with U.S. troops deployed in Iraq and Afghanistan, the U.S. military had to be perceived by Arab leaders as engaged in the region’s most troublesome conflict. The Mullen briefing and Petraeus’s request hit the White House like a bombshell. While Petraeus’s request that CENTCOM be expanded to include the Palestinians was denied (“it was dead on arrival,” a Pentagon officer confirms), the Obama Administration decided it would redouble its efforts – pressing Israel once again on the settlements issue, sending Mitchell on a visit to a number of Arab capitals and dispatching Mullen for a carefully arranged meeting with Chief of the Israeli General Staff, Lt. General Gabi Ashkenazi. While the American press speculated that Mullen’s trip focused on Iran, the JCS Chairman actually carried a blunt, and tough, message on the Israeli-Palestinian conflict: that Israel had to see its conflict with the Palestinians “in a larger, regional, context” – as having a direct impact on America’s status in the region. Certainly, it was thought, Israel would get the message. What’s the meta here? The alleged views of two of the biggest guns in the U.S. military, who command wide respect in GOP and Washington hawk circles, on the imperative of the peace process to advance U.S. security interests in the region are being telegraphed as Israeli leaders may be feeling out a campaign to beat up on the American administration for calling Israel on perceived provocations that would set back fledgling peace talks. Some Israeli leaders, for their part, tend to believe the Arab states respect force and power and are more prepared to make peace with Israel and work with it because Israel is strong, not because it’s willing to come to the peace table. And one suspects Mullen’s alleged message is one they have heard variations of from their American friends many times before, although perhaps not with the same sense of urgency given the international and regional alliance the U.S. is trying to bolster to pressure Iran, the 200,000 plus U.S. troops the U.S. has in Iraq and Afghanistan, and the paralyzed state of the peace process for most of the past year. What’s the meta meta? There seems to be more in the ether in recent days suggesting a diverging of perceived U.S. and Israeli interests in the region, even as much of the region shares panic at Iran. See this in the Washington Post yesterday, and Tom Friedman’s New York Times column today. Petraeus apparently wanted the headache. Put differently, according to Foreign Policy, he recognized that it doesn’t make any sense for the senior U.S. military commander with responsibilities for the Middle East not to be involved in the number-one security problem in the Middle East. And so — I should mention I can’t vouch for this report’s accuracy; but wow — Petraeus recommended giving Central Command responsibility for the West Bank and Gaza. In the real world, that’s a sensible recommendation. In the world refracted through the prism of a conflict that makes everyone who encounters it more than a little irrational, it was never ever going to be adopted, because it opens the door for American military involvement in the Israeli-Palestinian conflict, which is a taboo subject (until it isn’t). And so it wasn’t. This is why Generals are supposed to stay out of politics. 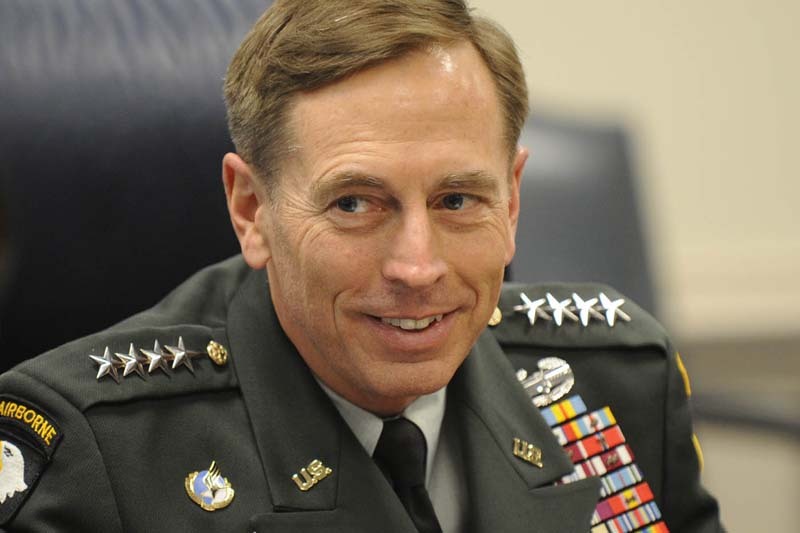 What did Petraeus think the Arabs would say if he asked them the question? They will be satisfied with nothing short of the end of the Jewish state. And why did Petraeus repeat what the Arabs said at face value without trying to analyze it? Sorry, but Israel is not going to roll over and die because the Arabs are unhappy with us. The Pentagon has a considerable role in Israel (joint training, military aid, intelligence-sharing, etc. ), but that role is of course subordinated to civilian policy. CENTCOM “engagement” with the Israeli-Arab conflict won’t do anything to change the issues that matter most to Arab governments. Petraeus can’t slash military aid or order Netanyahu to stop building in East Jerusalem. So perhaps this was purely a political gambit — an effort to light a fire under civilian policymakers. (Perry calls the U.S. military the most powerful lobbying group in the country.) Indeed, the Obama administration decided to “redouble its efforts” on the Israeli-Arab conflict after receiving the briefing. That’s not at all an appropriate role for a general to play — even though I agree with the arguments Petraeus made. The U.S. needs a strong counterweight to the Israel lobby, but I’m not sure it should come from the Pentagon. Gen. David Petraeus, the top U.S. military commander in the Middle East, did not formally request that the West Bank and Gaza be placed under his command’s domain, he told a Senate panel Tuesday. Petraeus was reacting to an article on Foreign Policy‘s Middle East Channel last week reporting that he briefed the Joint Chiefs of Staff about his concerns over how a lack of progress in the dispute between Israel and the Palestinians could jeopardize U.S. national security interests. The article originally stated that Petraeus followed up with a white paper sent to the White House that recommended the Palestinian territories be taken out of European Command’s area of responsibility and placed with his own Central Command. But in testimony today before the Senate Armed Services Committee, Petraeus denied that he made such a request and downplayed the discussions that he and other senior military leaders have had over the issue. The article was updated to say that CENTCOM did in fact recommend that the Palestinian territories be added to its portfolio, but made that recommendation to the Joint Chiefs, not the White House.